Looking for ways to keep visitors coming back for more? Creating great blog posts won’t get you results unless you have an audience that reads and engages with them. In this article I’ll share six ways to grow your blog audience and turn first-time visitors into devoted readers. 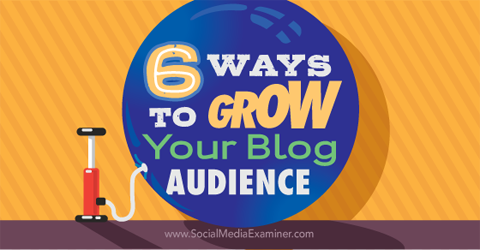 Discover six ways to grow your blog audience. The best way to grow your blog audience is to promote your content. Promote every post you publish as much as possible. For example, instead of just sharing your post on social media, pin the shares of your post to the top of your Twitter profile and Facebook page. 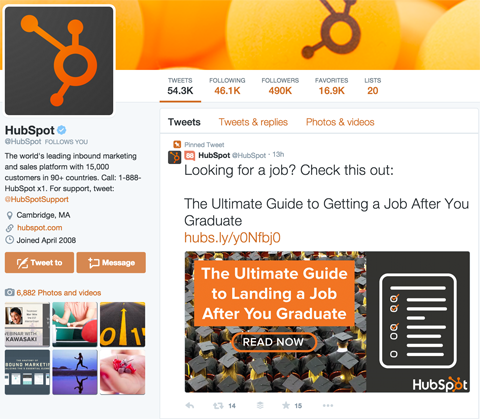 Keep your latest posts at the top of your Twitter profile. You can use social media advertising to promote shares of your blog posts on Pinterest, Facebook, LinkedIn and Twitter. 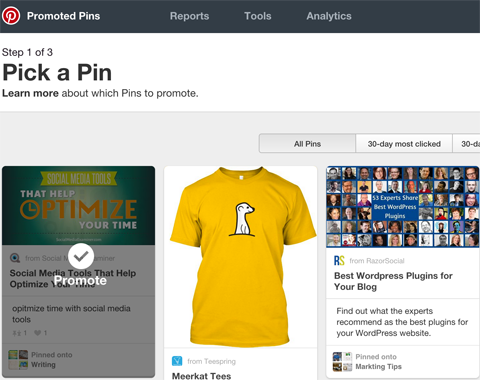 Promote your posts with social advertising like promoted pins. You can also use promotion strategies such as emailing your list and reaching out to influencers in your niche when you publish great content. This helps you extend the content’s reach and hopefully generate new readers for your blog. You know you need to publish quality content on your blog. But it’s also important to publish quality content on a consistent schedule. You don’t necessarily need to post something every day, but you should publish a new blog post at least once a week. If readers expect a new blog post at a certain time, that will keep them on the lookout for it. They’ll know that if they go to your blog once a week, they’ll be greeted with new content. If they go back to your blog and never see new content, they probably won’t return. You’ve likely read that growing your email list is the most important thing you can do for your business. While that’s true, email shouldn’t be the only subscription option that you offer. Not everyone wants to receive more email in their inbox, and if visitors can only subscribe via email, they likely won’t. The Digital Photography School blog offers their visitors clear and easy subscription options. Everyone should be able to find at least one option (email, RSS, Facebook, Twitter and so on) that suits his or her preferences. Give visitors multiple options for subscribing to your blog. It may also be helpful to create a specific page on your blog that explains your subscription options. While people in the marketing industry tend to be tech-savvy, beginners might need a better explanation of the benefits of subscribing by email, RSS or a social network. If you aren’t averse to pop-ups, you can also employ exit-intent technology to display a pop-up asking for visitors to subscribe before they leave your blog. Dan Zarrella found that employing a pop-up on his website doubled subscriptions without significantly affecting the bounce rate on his site. Visitors who enter your blog through your homepage should see lots of content options. While it may seem overwhelming, showcasing lots of content means readers will more likely find something of interest. 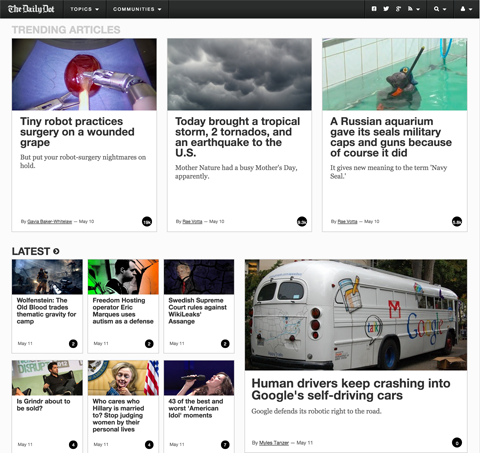 The Daily Dot has a homepage that highlights their trending articles plus top articles in multiple categories. Showcase a variety of content on your blog homepage. Make sure that visitors to individual post pages get to see related content and are encouraged to read more posts. 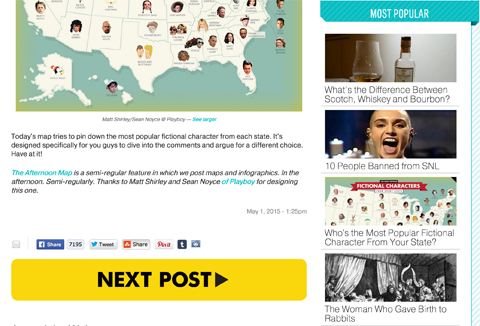 Mental Floss does this with popular posts listed in the sidebar and a large Next Post button at the end of each post. Get visitors to click through to another post. 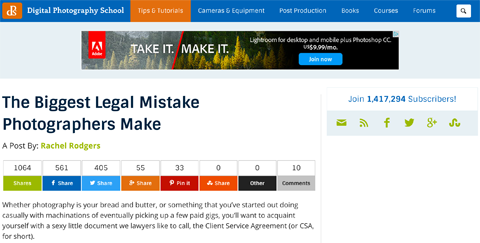 Ideally, you want to have a list of related posts next to and at the end of each blog post. That way, someone interested in reading more about Facebook will automatically see more of your Facebook-related content. If your blog has a minimalist design, simply refer to related blog posts using text links throughout your content. These links should compel visitors to click through to more of your content since it relates to the current blog post. Want to know how to get visitors to keep coming back to your blog? Let them know that you want to create content just for them. 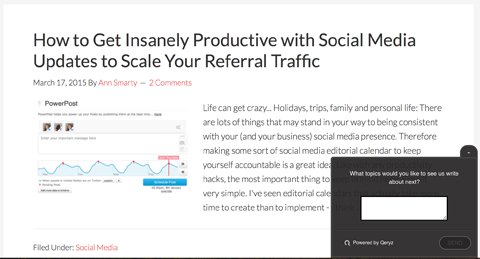 You can do this by adding a quick survey feature to your blog, like this one from Qeryz. Ask visitors what they want to read about next. A survey not only helps you learn more about what your visitors want, but also ensures that you won’t run out of blog post ideas. And once visitors submit a topic idea, hopefully they’ll subscribe to your blog so they can see if you use their suggestion for new content. There has been a trend lately to turn off comments on blogs in favor of social media engagement. Or, in some cases, blog owners do it to reduce the amount of moderation required because of spam. However, allowing visitors to leave comments on your blog turns a site with informational articles into a community. Visitors will know they can ask the author questions and interact with other readers, making them more likely to return. 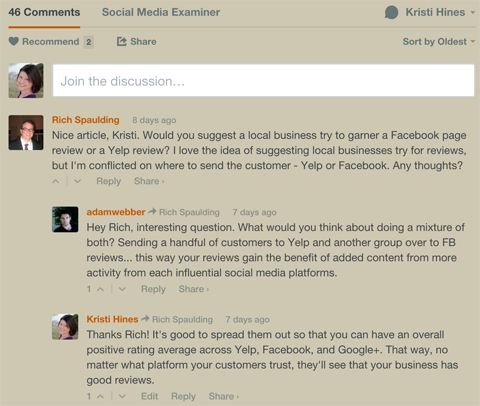 Create a community with blog comments. To encourage visitors to become loyal readers and members of your community, be sure to reply to comments on your blog for at least two weeks after a post has been published. After that, look for questions that you can answer in future blog posts. By following the above tips and creating quality content, your blog audience should continue to grow. The key is to think of more ways to keep new visitors on your blog longer and get them to subscribe before they go. What do you think? What tactics do you use to grow your blog audience? Please share your thoughts in the comments!